If you are a fan of the dewy skin look (nods) then this Urban Decay Drop Shot Mix-In Facial Oil is a product you will be needing on your list and in your stash. Oils are something I use within my skincare regime but not something I had ever used when applying makeup and admittedly, something I hadn't even thought about using until this product found its way into my life. I love Urban Decay as a brand, the Vice Lipsticks are some of my absolute favourites when it comes to the formula and the Naked Skin Concealer is a product I have re-purchased a few times now too, but having recently given the All Nighter Foundation a good run for its money, for me, this oil has changed how I feel about it. Described as being a multi-purpose formula that can be mixed with foundation to illuminate and condition skin. If you are familiar with using oils then this one shouldn't prove to be too hard to use either. 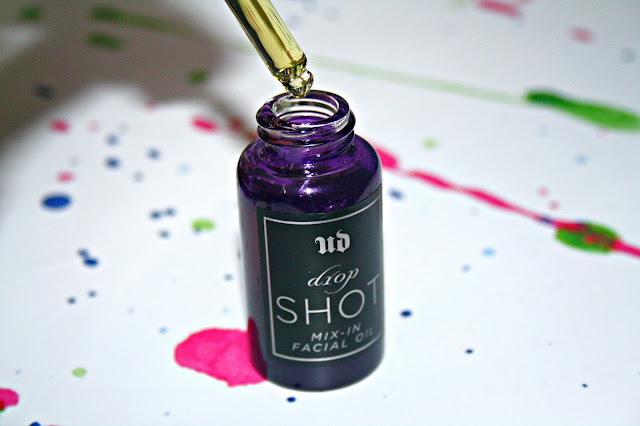 Create your own luxurious, skin-softening complexion cocktail with Drop Shot Mix-In Facial Oil. Add a shot of this oil to foundation for conditioned skin and a dewy, radiant glow. Our lightweight, nourishing oil blend helps makeup apply smoothly and blend easily, leaving skin soft, not greasy, and feeling plumped. Drop Shot can be applied to bare skin in an effort to boost hydration and create a radiant, non-greasy finish or it can be mixed into any of your other skincare and makeup products too such as your moisturising creams, your BB Cream, CC Cream, Tinted Moisturiser and of course your foundation. I have combination skin which leaves me with an oily t-zone and dry cheeks, so I often find that foundation can stick to the dry skin and slide off the oily skin, so I like to use products which do neither and often that includes having a good base and a decent setting spray. Using the oil, I have found that my makeup sticks less to these dry and flaking patches of skin and also helps deal with my oily patches too. Drop Shot is quite surprisingly rich in both nutrients and antioxidants, not something I was expecting to find. However, it contains a nourishing blend of jojoba, sunflower, macadamia, pomegranate, wheat germ, meadowfoam and olive seed oils which come together and work to condition your complexion. As it is an oil I did expect to find it a bit on the greasy side, but alas it is not at all, it dries down fairly quickly and absorbs when on bare skin to leave my skin feeling just amazing. Within my foundation, I really like how it sits and then there is the scent of the oil which is just divine with the jojoba oil dominating. 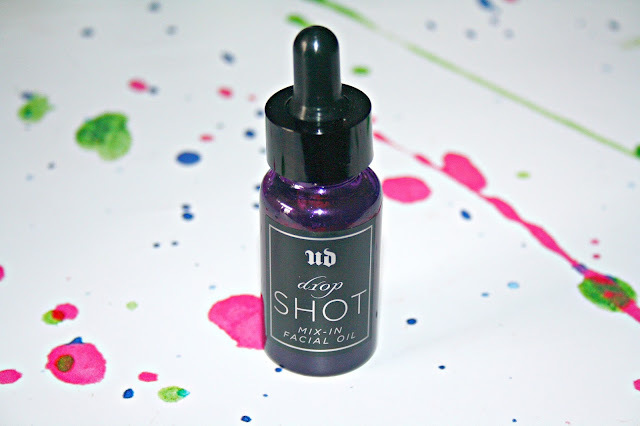 Priced around £24 for 24ml, this Urban Decay Drop Shot Mix-In Facial Oil has turned into a product I had never expected to come across, use or really really like. Have you tried it? I'm so terrified of adding oil to my super oily forehead! This sounds like a really interesting product. 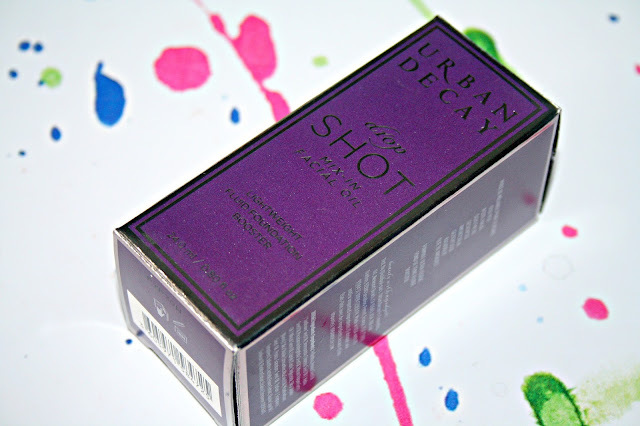 It's good to see Urban Decay stepping out of their comfort zone. Oh I'm so intrigued by this, definitely going to check it out! My skin type is exactly like yours, I get so oily around my nose but then often get dry patches on my cheeks. This product sounds perfect.